Lenny Kravitz has a new album dropping soon and a role in the highly anticipated film, "The Hunger Games." 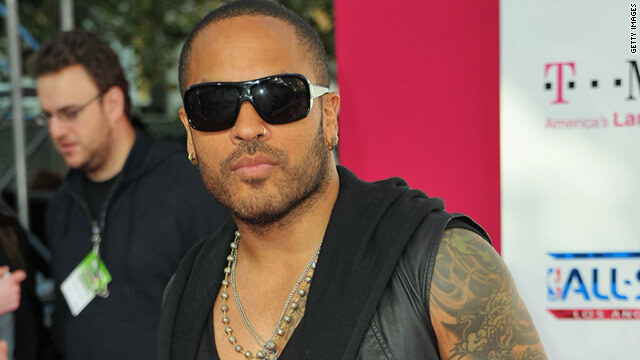 The rocker will also be seen as Cinna in the upcoming film "The Hunger Games"
(CNN) -- Two years ago, Lenny Kravitz was working on his latest album with a completely different premise in mind. Originally intended to be a funk album called "Negrophilia," named after a book he'd read about the dubious obsession with black culture in Paris in the 1920s, Kravitz wound up inverting the message halfway through to create the highly optimistic and all-inclusive "Black and White America (out August 30). His first album in three years, "Black and White America" delivers the signature big Kravitz rock and funk riffs, plus some more stripped down numbers and a collaboration with Jay-Z. Kravitz will kick off a tour in support of the album this fall. CNN recently spoke to Kravitz about the hidden inspirations on the album, his new foray into comedy and what he's most looking forward to about playing Cinna in the highly-anticipated film adaptation of Suzanne Collins' young adult trilogy, "The Hunger Games." CNN: "Black and White America" as we know wasn't the album you thought you were planning to put out when you started writing. What happened while you were working? Lenny Kravitz: The album started off being one thing, but I ended up starting completely from scratch because what was coming out of me just felt like now. Like, this is what you need to do right now. So I followed the creative spirit and where it told me to go. It's what I always follow. A lot of times you start with an idea, I'm going to make a this kind of album, it's going to be a theme album and the music's going to sound like this...and then you start working and it's like, no it's not. CNN: "Black and White America" is a really optimistic song. Can you talk a bit about the inspiration behind it? Kravitz: Thematically, the inspiration came from a documentary I was watching about these people somewhere in Middle America who were very much against what America had turned into. They were very unhappy that there was an African American president and they were going to do anything and everything to stop this. They were full of hatred and it sort of shocked me a bit. Obviously, I know that racism is out there but the fact that people had such rage and they were so backwards, it really blew my mind. That inspired the chorus of the song by me saying, "this may be what you think, but this is where we're going." And then it involved my parents' story with a verse because black and white America is really who I am, how I grew up and what's going on, so it ended up being the title track. CNN: The first single "Stand" just hit the radio. Are you going to release a video? Kravitz: I just cut the video. It's going to be very funny. I don't want to say too much about it, but it's not what you expect. Kravitz: No, no, no. "Zoolander" doesn't count. CNN: Even though it's a totally different song, I was getting a "Strawberry Letter 23" vibe from your track "Superlove." Is that crazy? Kravitz: No, that was the inspiration. I wanted to write my "Strawberry Letter 23." I wanted to write something that had that feeling, that air. What I like about that track is the soul and the funk and also the psychedelic and the airiness. "Superlove" has this funky track, but at the core of the track is a 12-string acoustic guitar, which is very reminiscent of what Quincy Jones and the Brothers Johnson were doing or would do. Really lush, floaty background vocals, guitar solo, funky poppin' bass. I just wanted those elements. CNN: What are some of the other standout tracks on the album to you? Kravitz: There's a song called "Push," which is the last song on the album. It's a really beautiful, uplifting song. CNN: Does that have anything to do with Sapphire's novel "Push" or "Precious?" Kravitz: Yes! It was inspired by my experience in the film. No one's asked me that question. Not a one. CNN: Well, let's talk about it! Kravitz: It's kind of an urban story, but it's all about pushing your life and finding your way and not stopping until you reach your goals and your destination. The song isn't about Precious the girl, it's someone who's looking to get from one situation to the next. CNN: And speaking of your acting experiences, you've been cast as Cinna in "The Hunger Games." Have you read the books? Kravitz: Of course. I'm really excited to be in it. I'm really anxious to see how they put this whole world together because if you've read the books you know the world is quite fantastical and amazing, the Capitol and the Arena. CNN: I am a Katniss fan, of course, but Cinna feels like the heart of the series. Kravitz: It's funny, a lot of people say that. Why do you say that? CNN: Because he's got Katniss' back. He's very supportive, but he's also really subversive. Kravitz: That's why ["Hunger Games" director] Gary Ross called me; because he said he'd seen Precious and he liked how I underplayed the character. It's not a similar role, but in a sense it's got a similar quality because [Nurse John] was the only backup for ["Precious"]. CNN: Have you seen costume sketches or anything? Kravitz: Not a thing! Not a thing! That's why I'm just as curious as you. CNN: But Cinna's not that crazy looking. He wears all black and gold eyeliner. Kravitz: He's kinda slick, right? CNN: Have you met Jennifer Lawrence? Kravitz: Yes, I know her actually because she did "X-Men: First Class" with my daughter, [Zoë Kravitz], so she spent a lot of time in my house in Paris when they were filming in London. That was another thing about casting me: [Ross] said, I heard that Jennifer was in your house all summer and that you were taking care of the kids and they were cooking. I had the whole cast, like six, seven kids in my house on the movie so I got to know all of them before I had even seen them in action. So Jennifer and I ended up becoming friendly. She's really sweet. And then I saw her in "Winter's Bone" and I was like, "Oh, wow. This girl is for real." Kravitz: I didn't see any online stuff, but, yeah, the fans don't play. What do you think about Woody [Harrelson] as Haymitch? CNN: The casting has been pretty terrific, but also really unexpected. Kravitz: I know I was unexpected!